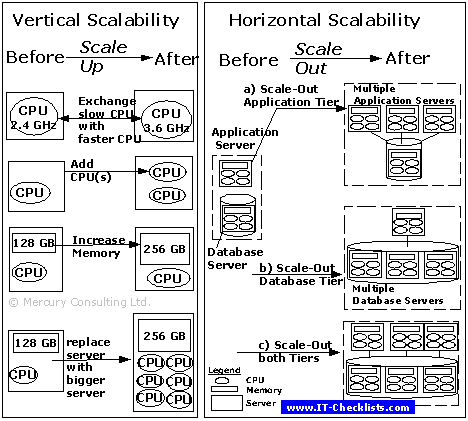 In IT systems scalability means the ability to increase a system's capacity (throughput) by adding resources like CPU, Memory, Disks and increasing Network capacity to support more users and / or more concurrent transactions. can the application utilize the additional CPU's? will my single long running report or batch job utilize more than one CPU and finish in less time? Is the application designed for multi-server deployment? Would using an external workload balancer distributing requests to 2 servers end up in duplicate customer-ID's ? To ensure that the application will scale according to your needs, the detailed requirements need to be carefully selected and formulated. Our “Template for Non-Functional Requirements” dedicates one chapter to scalability-requirements.